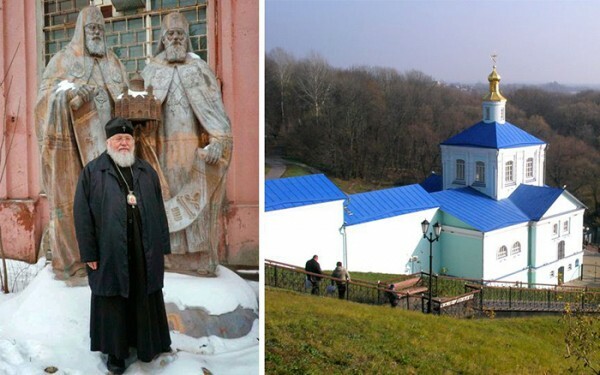 A sculpture depicting the late Patriarch of the Russian Orthodox Church and the late First Hierarch of the Russian Orthodox Church Outside of Russia holding the Kursk-Root Icon of the Mother of God "of the Sign" will be unveiled in the monastery of the Nativity of the Most-Holy Mother of God, “Kursk Hermitage,” as reported by Kurskaya Pravda. The new monument expressed the main idea of the historic event which brought to an end the tragic period of division within the Russian Church in the 20th century, the signing of the Act of Canonical Communion, which took place in Moscow on May 17, 2007. His Holiness Patriarch Kirill of Moscow and All Russia issued his blessing for the establishment of this monument, according to an official letter from His Eminence Metropolitan Varsonofy of St Petersburg and Ladoga, Chancellor of the Moscow Patriarchate, received by Governor Alexander Mikhailov of Kursk oblast. The sculpture was created at the initiative of benefactors and given as a gift to Kursk oblast. Why will this monument be situated in Kursk? Because it was here that at the end of the 13 th century that the Miracle-working Kursk-Root Icon of the Mother of God first appeared, which became the main holy icon of the Russian diaspora in the 20th century. It has since then been kept at the Synodal Residence of the Russian Church Abroad in New York City. In 1920, the icon was evacuated from civil-war-torn Russia, first to Serbia, later, in 1944, to Germany. With the emigration of Metropolitan Anastassy, First Hierarch of ROCOR, to the United States in 1950, the icon accompanied him and placed at New Kursk Hermitage in upstate New York, established in 1951. Since 1957, the Kursk Icon spent most of the time at the Synod of Bishop in New York City. After the reestablishment of full fraternal communion within the Russian Orthodox Church, a new tradition has originated: beginning in 2009, the icon has made annual visits to the place of its appearance in the Kursk Diocese for veneration by the local faithful. The next visit of the Kursk-Root Icon, which became known as the “Hodigitria [Protectress or Guide] of the Russian Diaspora,” will take place from September 22-October 2. It is expected that the new monument will be unveiled during that time.